I always start to plan my weekly menu on a Thursday after I have received by weekly veg box delivery from Wild Star Food. 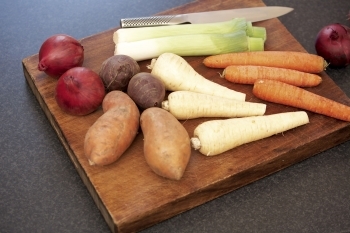 We alternate between the Food Miles box and the Mini Gourmet, but at this time of year you will always get root vegetables, so what to do with them. This weeks menu has very much been lead by an over abundance of roots, especially considering I hadn't used up all the veg we had received the previous week. So this is what I had to work with, Potatoes, Carrots, Parsnips, Swede, Kohlrabi, Leeks, Golden Beetroot, Sweet Potato, Onions, Green Pepper and Cabbage; and this is what we are going to eat. THURSDAY - Spouffle, this is one of my go to recipes at the moment, but as I didn't have any spinach or courgettes I substituted leeks and it turned out quite well. FRIDAY - Smoked Salmon, Potato Salad, Beetroot Salad, Rye Bread and Dill & Creme Fraiche Sauce. I'm currently torturing Fluffrick every day by watching Jamie's 30 Minute Meals and I saw him do an iteration of this a couple of week ago. It did take far longer than 30 minutes as I baked my own bread and cooked my own beetroot. SATURDAY - Tomato Cheesy Pasta Bake, this I usually make with the addition of Broccoli the like, but instead I had to use Kohlrabi and Carrot and it turned out okay, well everyone ate it. SUNDAY - Country Chicken Casserole, I already blogged about this in Warming Food for Cold Days. It's really good for using lots of root vegetables. MONDAY - Mushroom Dopiaza, Bombay Potatoes and Rice, I think I'll try and sneak some Cabbage into the Bombay Potatoes, just a little and hope Fluffrick doesn't notice. TUESDAY - Chicken and Vegetable Soup with Parsnip and Rosemary Rolls, this should use Parsnips, Leeks, Carrots, Onion and Swede. WEDNESDAY - Vegetable Stir Fry with Potsticker Dumpings and Noodles, this should utilise, Onion, Carrots, Kohlrabi, Cabbage, Green Pepper and Mushrooms. THURSDAY - Twice Baked Potato, if it's a cold day, this will be like a lovely edible blanket, yum. I'm giving Mum an animal based protein some kind, every other day, hopefully that will go down okay and hopefully I won't get too many root vegetables in this week's box. Cabbage! Cabbage, you say?! Grrr! Grrr! And other, onomatopoeia-like utterances.